Embellishing the southernmost coasts of the Indian Subcontinent, stretches out the city of Thiruvananthapuram, the capital of Kerala. This picturesque town, spread over a gently sloping coastal area, is home to innumerable popular tourist attractions that are located in and nearby the city. Various other major destinations, which are globally known for being some of the best places to visit in South India, are situated within a distance of just few hours from Thiruvananthapuram. 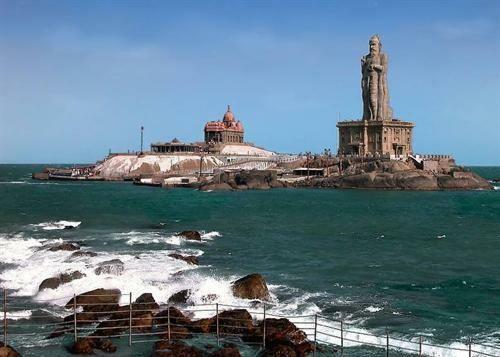 Easily reachable by road, one of these finest destinations in the southernmost part of India happens to be Kanyakumari. Lying at the southernmost extremity of the mainland, the city of Kanyakumari in Tamil Nadu extends is the end point of the Cardamom Hills in the south of the nation. The Vivekananda Rock Memorial, the Kanyakumari Temple and the Gandhi Memorial are some of the countless sites to visit in Kanyakumari, which is also popular internationally as Cape Comorin. The distance on road from Thiruvananthapuram to Kanyakumari is about 85 kilometres. Sightseers interested in exploring Kanyakumari by moving southward from Thiruvananthapuram can opt for a bus ride or take a car on hire to reach this city on road. A bus is an affordable mode of transportation to Kanyakumari from Thiruvananthapuram. The travellers can board a bus at the KSRTC bus station in Thiruvananthapuram, which is positioned right at the front of the Trivandrum Central Railway Station. A rental cab, may cost a bit, but is a more comfortable option for travelling to Kanyakumari from Thiruvananthapuram by road. Visitors can arrange for their bus tickets for Kanyakumari from Thiruvananthapuram from the travel agents or bus operators in the town or can book their tickets either personally or online for the chartered or private bus services available from Thiruvananthapuram to Kanyakumari. Volvo AC, Non-AC, sleeper and seater - various categories of buses, are run along the route from Thiruvananthapuram to Kanyakumari. The state buses operated from KSRTC bus station are also an ideal option for travelling to Kanyakumari from Thiruvananthapuram by road. After leaving Thiruvananthapuram for travelling to Kanykumari on road, one should move towards south up to the Power House Road and turn left after reaching it. The Indian Overseas Bank comes at the right along this road after which one should turn right to get at NH 66. The first exit at the roundabout on NH66 then takes one to the Panvel-Kanyakumari Road. After moving past the Indian Oil Pump of Sreedhara Panicker and the HP Petrol Pump along this road, the traveler should turn right along the Panvel-Kanyakumari Road. Moving further one has to travel past the BP petrol pump and the SP Multispecialty Hospital as well. Continuing along NH 66, also known as the Panvel-Kanyakumari Road, one should next turn left and move past the Vijaya Hospital. The traveller then need to move past Sam Hospital and then turn right along NH 66. The Muthukumar Ortho centers come at left along this route. After moving past the Shirdi Sai Baba Temple on this route one should then turn right along NH 66 and finally turn right again along this highway to get at National Highway 7. From this point the distance to Kanyakumari is just 2.4 kilometres.